It’s a common question: how do I know if my car can tow that caravan? As you’ve probably noticed, there is a lot of advice on this topic, in printed magazines and in online forums. Much of it is good advice and should be heeded. But you’d be forgiven if all of that advice had your head spinning, especially if you’re a first-time caravanner. So let’s see if we can break it down for you. Ensuring your tow vehicle is suitable for the job at hand, you see, is not the dark art that some people would have you believe. But it is important that you follow a set of non-negotiable rules. First, investigate the maximum towing capacity of your vehicle. This figure is stipulated by the manufacturer of the vehicle and it can usually be found in the owner’s handbook and sometimes on a placard on the towbar, if the towbar was fitted by the manufacturer. Older vehicles might require some extra investigation but, whatever you do, don’t make any assumptions as it’s easy to be tripped up. The towing capacity of certain models of vehicles has been increased to meet the demands of Australia’s growing RV market, but just because a later model of a particular vehicle has had it’s towing capacity increased does not mean the manufacturer has retroactively increased the towing capacity of earlier models in the range. In fact, that rarely, if ever, happens. Now that you’re confident in the overall towing capacity of your vehicle, it’s important to ascertain its maximum towball mass. This is the total permissible weight that can rest on the vehicle’s towbar and, again, it’s stipulated by the manufacturer of the vehicle. The rule of thumb is that a vehicle manufacturer allows 10 per cent of the total towing capacity to sit on the towbar but pay particular attention here, as this is not always the case. The 80 Series LandCruiser – which is what I use for towing duties – is a case in point. Pre-1996 models were fitted with a towbar at factory that only allowed a measly 113kg when the overall towing capacity of the vehicle was a reasonable 2500kg. Subsequent models had a 3500kg towing capacity and 350kg towball download. Thankfully, Hayman Reese manufacturers an aftermarket towbar rated to 250kg for pre-1996 models and 350kg for later models, but, again, don’t count on an aftermarket solution – the vehicle’s manufacturer might not allow it. Like with the overall towing capacity, you must not exceed the maximum permissible towbar mass of the vehicle. It’s now time to match your vehicle to a caravan. There are two key figures to understand here: Tare and Aggregate Trailer Mass (ATM). We’ll discuss the others, too, but let’s wrap our heads around these two first. Tare is the unladen mass of the caravan or camper trailer. It refers to the weight of the van as it leaves the factory, excluding any options that might be later added by a dealer, such as a generator or solar panel. 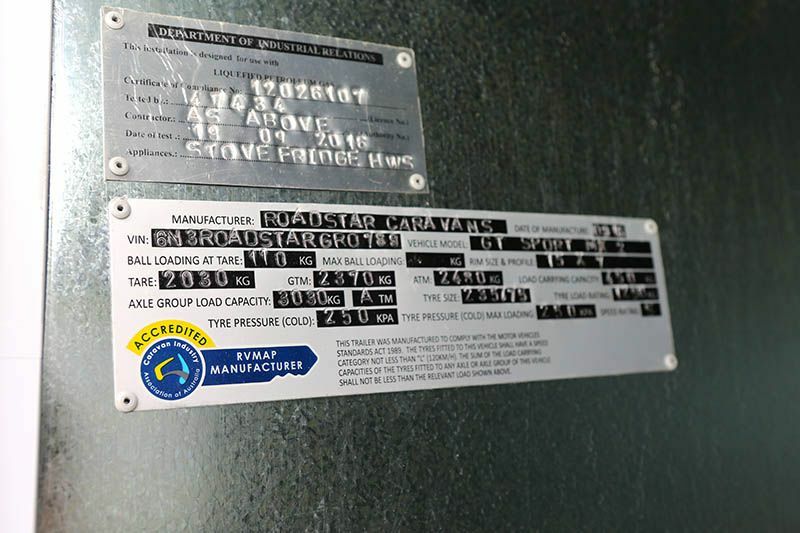 The Tare figure is also usually measured ‘dry’, i.e., without water in the tank or gas in the cylinder; however, there is a small number of RV manufacturers who measure Tare ‘wet’ (with water in the tanks). It’s worth asking this question. ATM is the total permissible weight of the caravan or camper trailer, unhitched from a tow vehicle, as stipulated by the rig’s manufacturer. Like with all the weights relevant to the van, the ATM should be engraved onto a compliance plate, found in either the front boot, the tunnel boot or riveted to the drawbar. The weight difference between Tare (unladen) and ATM (total allowable weight of the van, unhitched) is your payload. If, for example, the Tare of a pop-top Coronet was 1800kg and the ATM was 2100kg, the 300kg difference is what you have to work with when it’s time to pack the van. It becomes a little tricky when you factor in the weight of the water in the tanks and the gas in the cylinder(s), however. Remember: 1L of water weighs 1kg, so in this scenario an 80L water tank and a 9kg gas cylinder, if filled before travelling, will reduce the payload capacity to 211kg. Is that enough for your needs? That’s a difficult question, and one that only you can answer; however, if the payload is not sufficient, it might be worth discussing your options with the manufacturer of the caravan, as in some cases the ATM will have been ‘de-rated’ so that the van appeals to owners of certain vehicles. For example, a van that could, technically and legally, be rated with an ATM of 3000kg may have been rated with an ATM of 2500kg so as to catch the attention of Prado owners. This situation is by no means a given, though, so do not count on the manufacturer being able to upgrade the ATM of your caravan. At the end of the day, regardless of whether you believe the ATM should be higher, it is crucially important that you do not exceed, in terms of the overall towed weight of the van, what its manufacturer has deemed suitable. You’ll see this figure on your van’s compliance plate, alongside Tare and ATM. When it comes to safe and legal towing, however, it’s not as relevant as the other two. Gross Trailer Mass (GTM) is the total permissible weight of the caravan when it is hitched to a tow vehicle. In real terms, it equals the ATM minus the towball weight. With many tow vehicle/van combinations, understanding and applying the above rules is enough. It boils down to a couple of things: research the overall towing and load limitations of the vehicle/van combination and do not exceed them. But there is a sticky wicket to be aware of: Gross Combined Mass (GCM), the most prickly of towing weights. GCM refers to the total combined weight of the tow vehicle and the caravan, the maximum of which is stipulated by the manufacturer of the tow vehicle, not the caravan. And it’s all too easy for things to become unstuck by the dreaded GCM. Let’s take a look at the LandCruiser 200 Series GXL turbodiesel. This vehicle has a kerb weight (unladen weight) of 2630kg – this is what it weighs when it leaves the factory. Its Gross Vehicle Mass (GVM – the total permissible loaded weight of the vehicle, including all passengers, cargo, fuel, etc.) is 3350kg. The Gross Combined Mass, meanwhile, is 6850kg. This leaves a difference of 3500kg (6850kg minus 3350kg), which is the maximum allowed towing capacity for this substantial vehicle (which also allows 350kg on the towball). In the above example, the difference between the kerb weight and the GVM is 720kg. That figure accounts for passengers, fuel, etc., and on the face of it, seems plenty. But bolt on an aftermarket bullbar, a roof rack, a long-range fuel tank, and a winch, and that 720kg will diminish quickly. But let’s keep our focus on the GCM. While the 200 Series is rated fairly sensibly in this regard, life isn’t always so easy, with the manufacturers of some vehicles (particularly dual cab utes) rushing to promote their 4WDs as being capable of towing 3500kg – a capacity that is, nowadays, highly valued by caravanners. Here’s an example. The Ford Ranger PX dual cab ute has a GCM of 6000kg and a maximum towing capacity of 3500kg. If you were to use this vehicle, then, to tow a caravan weighing 3500kg fully loaded, the maximum that the Ranger could then weigh would be 2500kg. The problem with this is, the Ranger has a kerb weight of 2200kg, leaving a paltry 300kg in reserve for payload (passengers, fuel, cargo, etc.). If the hypothetical owner of this Ranger adds some aftermarket accessories, its kerb weight would be higher and payload capacity even less. The advertised towing capacity of 3500kg, in this scenario, might sound attractive but it’s a long way from realistic. So you’ve wrapped your head around the above concepts. What now? Do you need to visit a weigh bridge every time you travel to ensure you haven’t exceeded the van’s ATM? Personally, I believe that’s unrealistic. I’ve known people who’ve individually weighed all the objects they load into their van and kept a running tally, while others have simply estimated. The best approach probably lies somewhere in between. Apply some common sense, perhaps individually weigh the heavier items, and if in doubt, pay that weigh bridge a visit. Ultimately, if you are found to have done the wrong thing, you as the driver will be held accountable. When it comes to ball weight, the best bet is to purchase a set of ball weight scales. Yes, you can measure your van’s ball weight at a weigh bridge by placing the jockey wheel on the scales but by then you may have already been driving around with too much towball mass. A portable set is relatively inexpensive and easy to use. Unfortunately, however, no matter how well you’ve applied the above rules, some vehicles and vans are not a good combination. It could be that despite being suitable on paper, a certain vehicle lacks sufficient engine torque or general stability to do the job well. That’s where common sense comes in. A ‘solid’ tow vehicle will have plenty of wheelbase and will weigh significantly more than the towed object; if the van is heavier than the vehicle, it will tend to ‘push’ the vehicle in ways you do not want it to. It will also have a well-maintained, sufficiently powerful engine, sound transmission, etc. When all is said and done, put the safety of you, your passengers and other road users first. Do not ‘push the limits’ when loading up your van and tow vehicle – leave the kitchen sink at home where it belongs and ask yourself if you really need to take two portable coffee machines when only one will do. In a lot of instances a motor vehicle Kerb Weight includes all the vehicle fluids including petrol. I think you also missed the opportunity to highlight the fact that the 720kg will be severely reduced by the Ball Weight figure when attaching the van. Hi Peter, you’re absolutely right. The “payload” from my understanding also includes the tow ball weight. Great read. We purchased a set of ball weight sales when we upgraded out car late last year. Easy investment and gives us peace of mind while towing. Thanks Christopher. I agree: a set of ball weight scales is a good investment. While some vehicle manufactures state combined gross vehicle weights, I don’t believe that the 200 series Landcruiser has a combined gross vehicle weight. Toyota have advised me that the GVM of the Landcruiser is as stated in the owners manual and that if fully loaded to this capacity it can then tow it’s maximum 3500 Kg,s as per its towing capacity and that the two are not related. Lovell’s, a company that does GVM upgrades to 3800 Kg’s for series 200 Landcruisers has also confirmed this by stating that with this 500 Kg GVM upgrade the series 200 can still legally tow its maximum 3500 Kg’s. I should also have mentioned that with the Lovell’s upgrade it is certified by an engineer and a new compliance plate is issue by them. Dealer says ‘no sale’ as the van max (150) is over the car limit (100). I thought they (police/insurance) went by the 80kg? I realise packing will have an impact on ball weight and the idea is to locate the van load in a manner to achieve the 80kg ball weight. I’m not talking about what is recommended, or desirable, or a ‘rule of thumb’. I mean if you get pulled over by transport police, or police look at the facts & figures of your car and the caravan plate – or you make an insurance claim.